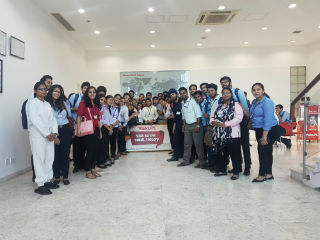 Students of PGDM went for an industrial visit to Yakult manufacturing unit in Industrial area at Sonepat on 10th August, 2017. Yakult Danone India Pvt. Ltd. is a 50:50 joint venture between Yakult Honsha, Japan and Groupe Danone of France, both of them are global probiotic leaders. The JV came into existence in India in 2007. Yakult is a fermented milk drink containing 6.6 billion probiotic (friendly) bacteria and is manufactured at this plant. This is only Yakult manufacturing plant in India. Ms. Yamini (PR manager) gave presentation to the students. She described all the functions, benefits of Yakult and its production and presence worldwide. Students were taken around the plant and were explained about the production and packaging process. About 3,00,000 bottles of Yakult are produced in a day. Students also interacted with the staff of the Yakult and were shown videos related to Yakult and its benefits. The process of making Yakult is totally automated and is internationally designed as per highest hygiene standards. Students cleared all the queries and were also given Yakult drink (65ml) to taste. 1. GRAS (Generally Regarded As Safe) from US FDA. 2. FSSAI product in India. 1. Helps in improving digestion. 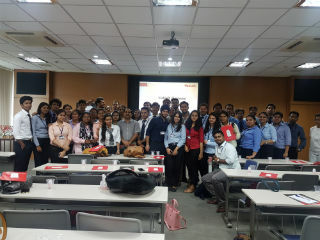 Overall it was highly interactive and full of learning for the students on the concepts relating to production and manufacturing plant. The visit ended with group photograph and thanks giving to Yakult staff.